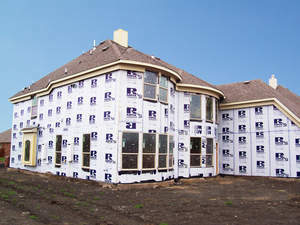 DALLAS, TX--(Marketwire - Sep 13, 2012) - Rmax Operating, LLC of Dallas, Texas announces the immediate availability of its Thermasheath-SI Residential Building Solution, offering structural bracing, continuous insulation, air barrier and water barrier all in one, according to Greg Fantin, Rmax Vice President of Marketing. Thermasheath-SI satisfies structural and energy code requirements, while acting as an effective air and water barrier, in an easy-to-install continuous building insulation envelope that qualifies for LEED credits. The product represents the second new release by Rmax in three months, following the release of the company's ECOMAXci Wall Solution for commercial buildings in June. "Structural insulated sheathing is a relatively new concept in residential building design," Fantin said. "The immediate availability of our product should relieve some of the pent-up demand." Because Thermasheath-SI features Rmax POLYISO foam insulation at its core, the product delivers the highest R-value per inch of any comparable insulation on the market. The closed-cell foam is bonded to reflective, reinforced aluminum foil facers, creating a radiant barrier with structural stability for lateral bracing and transverse loads. No OSB sheathing is required. "Thermasheath-SI puts the power of multiple building products together into a single application," Fantin said. "The product reduces the cost of labor and materials, lowers overall energy consumption and maximizes a builder's profit -- in one code-compliant package." Since 1978, Rmax has been manufacturing commercial, industrial and residential POLYISO insulations products, providing engineered solutions for enhanced energy efficiency. For more information on Rmax or its new Thermasheath-SI structural insulation solution, visit www.rmax.com or call 1-800-527-0890.